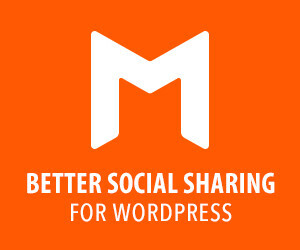 I am trying to offset my links within the plugin from WordPress. Unfortunately, it is not working correctly or at all. I have a second menu setup at the top of the page, once I click that the offset should help make it stop before the content gets cut off. Also, the page is skipping down to the place on the page and not scrolling down as I have it set to do. I would like it to scrolling down the page instead of skipping to the spot. Hi. Thanks very much for this plugin, I’ve used it on a number of sites, so far without any hitches. However I have a small problem on a site I’m developing which I can’t for the life of me work out. Highlights are all fine except for the Membership section. As far as I can tell it’s identical in every way with all the other sections but its menu item only highlights if the page is reloaded from that section. Once you scroll, all sections highlight as they should except that. The class “mPS2id-highlight” isn’t being applied it. I just checked your page and this happens because you have a second “#membership” link (“Become a member”), so the script highlights this one instead of the one in the menu. This is easily fixed by adding your menu links selector in the “Highlight selector(s)” field in plugin settings, e.g. The “Highlight selector(s)” field is basically telling the plugin which links are eligible for highlighting in case you have multiple anchors with the same href in the document (as in your case). Helo, i installed the app on my wordpress and it only seems to scroll down and stop scrolling.. If you want a horizontal scrolling you need to set “Layout” to horizontal (or auto for both axis). The highlight classes work fine but due to the above CSS the links get “hidden”. I would like to ask you about the problem I have got. I am using offset and it work fine in normal desktop and tablet resolution. If I go to the smartfon resolution the offset stops to work. I don’t know why. Do you have any idea what can be wrong? I can’t really say but in general, plugin’s offset works regardless of screen size. I would be really appreciative for your help. There are 2 menus. The second which you can see in the mobile view you will find in id=”offcanvas”. There is every thing done as in the normal menu. According to me it shoud work fine but it is not. Maybe you will find the solution. You can see that another script handles the mobile menu links as it disables all scrolling when menu is opened and when you click a link, it closes the menu and then scrolls to the id. None of these are done by “Page scroll to id”. it is exacly what you suggested. I was wrong because I tought that if there is scroll on the page it must be done by your plugin. Now I know that there is another one as well. I have to find out how to make your plugin working in mobile menu as well. Hi am just building my site right now and I am working with this plug in and I must say first of all THANK YOU, and you did a wonderful job. Only suggestion is with this tutorial for the people like me who aren’t very good with coding if you could include a segment in the tutorial about what needs to be done for the return to top part. Do you need to add something into the Link Relationship (XFN)? What needs to be added into the HTML to make my button go to the top of the page? Back-to-top links work the same as any other link handled by the plugin. If your link’s href/URL is set to “#top”, the plugin script will automatically scroll the page to the top without the need to have a target element with id “top”. So, if you create your back-to-top link in WP menu, set “Link Relationship (XFN)” to “m_PageScroll2id” and its URL value to “#top”. As long as your link points to “#top”, you don’t have to do anything in the HTML (no need to create target element). Hi, I’d like to try this plugin. Just wanted to know if it’s possible to keep the tabs fixed (always visible) when scrolling to an id? The plugin does not modify your theme’s markup or CSS (except for the highlight classes) so its functionality is not affected by your menu position. Unfortunately I can’t get it work. Here is my site – http://web.derigs.lv/alion. 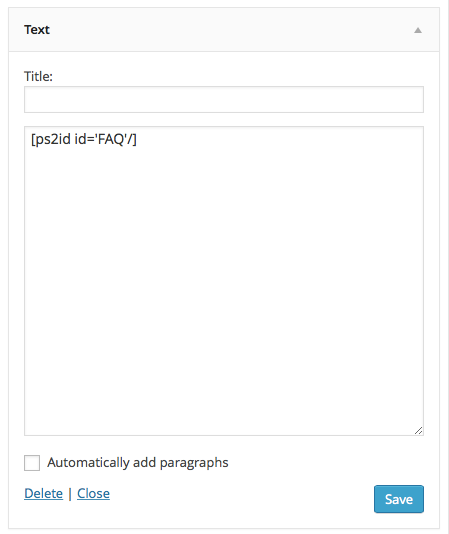 I set up menu as customs links with m_PageScroll2id relationship, I have div #content, but scrolling won’t work. What I’m doing wrong? Scrolling works for me (tested in Chrome, Firefox). I don’t know what you mean by “not working” but the actual page scrolling is really short so maybe you don’t notice it? Try decreasing your browser’s height. Also, your menu links all point to different pages so page scrolling happens after each page is loaded. Actually, that is the idea – when menu is clicked, new page is loaded and div.content (between and ) scrolls vertically to another page div.content. Is it correct – that’s what Scroll to location hash does? May be I should preload all the pages vertically, than set overflow to hidden to make it work? Yes, that’s exactly what “Scroll to location hash” does so you can use it as it is. Love your plug-in but the scroll animation speed doesn’t change – I want to slow it down. How do I fix this? The option “Scroll animation speed” should work. Increasing its value will increase the animation duration. If this setting does not work, then your links are not handled by “Page scroll to id” but by some other script from your theme or another plugin (you can test this easily by deactivating the plugin and see if page animation still works). Thanks for your response! I deactivated the plugin to check, and it is definitely the plugin that is causing the menu to work. I adjusted the speed again and now it is working if you click on the ‘home’ menu botton, but not with any of the other menu functions, even though they’re set up the same way. Any ideas on how to fix this? Your links seem to be handled by more scripts than “Page scroll to id”. I inspected your menu links with dev tools (jQuery audit) and they have 3 click events attached. One of them is by “Page scroll to id” (it has plugin’s namespace). The other 2 are probably attached by your theme or some other plugin (I wouldn’t know, they have no namespace). It seems that these other script(s) are somehow handling your menu items that point to an existing id within your content. The “Home” link works as it points to “#top” which does not exist as id but it’s handled internally by “Page scroll to id”. I can’t really provide a solution as the links are handled by more than one scripts (at least I hope I gave you some help regarding the origin of the problem). Hi my client has requested a navigation that has a drop down menu, with the drop down menu for each page using the one page layout for each so in essence it will scroll down to a section on the page. In wordpress I made the navigation in the pages. I’ve tried using this plugin but can’t seem to get it working. I tried setting it up in the menus but then nothing happens (not sure if this is because my navigation is set up through pages not menu) Anywho if someone could point me in the right direction of how to go about this. I’ve made one page websites from scratch before but never on the wordpress cms, everything I try doesn’t seem to work… I’m stumped! I’d need to see how your drop-down menu works. Have you added the rel value to your links? If you can’t add a rel value, you can change your links selector in “Selector(s)” filed in plugin settings. This plugin looks great but I can’t make it works. I create my pages and my menu with links (with the full url) I must put # or not… I want it to scroll horrizontally. Can you help me please ? Thanks a lot. Great plugin, works straight out of the box. I have a unique use case though that I am having trouble resolving. Can Scroll to ID be used inside a Nivo Light Box. The issue I am having is finding the right selector for the Scroll to ID to use, as the lightbox is already using ‘#inline-content’ to display the content in the lightbox. Am I able to use Scroll to ID in this way? Many thanks for a great plugin. Ok, so I managed it by using an iFrame and creating a blank wordpress template for an iFramed page that uses Scroll to ID. Not ideal but it works for now. If you have an alternative, non iFramed way to accomplish this I would be interested to hear it! Hi there, just in need of some advice, this site is specifically a dev. site right now. I’ve put the #id into each section via “beaver builder” – which is a visual builder – Each section row enables an #id, which can be seen when you click on a section and ‘inspect element’. I’ve followed the instructions for the menu (so they link to the section #id’s) but it isn’t working and I can’t for the life of me figure out why. Could you see if the relationship between menu items / section id’s is being interrupted somehow or, for some reason invalidated? I like this plug-in and would love to get it working. Hi again, really sorry to bother you, but from the FAQ page (or any page outside of the home page) some menu items aren’t lining up well with their correct #id. I think it might be because it has to scroll passed a video in the background which may be being loaded dynamically when the home page is “ready” – I’m just wondering if there’s a work around for this? If i click the menu twice it works, or if I click any menu item within the home page everything is fine, it just seems to be from another page, with any menu item after ‘testimonials’ – I guess just let me know what I can do here. I also sent a donation your way since this plugin is really great. It’s almost too good to be free, especially with your prompt support. Indeed that’s why this issue happens. The theme seems to set the container height dynamically after the video is loaded, meaning that each section after it has changed its top position while the page is scrolling (that’s why when you click a second time it goes to the correct position). Check if the issue is fixed. If it’s not, increase the value of 600 a bit (e.g. 800) and check again until it works. This value is a delay so page scrolling happens after video is loaded. Totally fixed. Really appreciate your help & feedback. Many, many thanks. 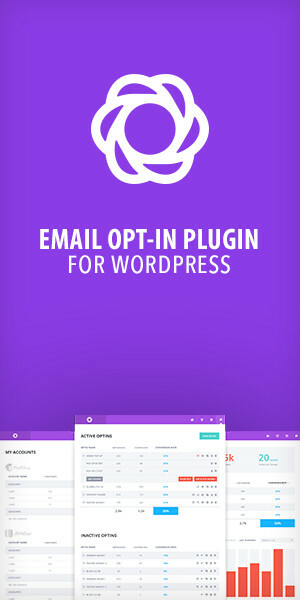 The plugin is great, the support is phenomenal, I will be continually using this plugin for all my WP projects. I have also a problem with the scrolling animation. There is no animation on my page. If I click on a navigation-link it jumps right to the section, but there is no smoothing animation. Do you have any solution for me? It sounds like the script is not handling your links. Do you have the element with id “#section1” in your content? Is there a link where I could see your page? Page Scroll to Id has been working fine until I created a drop down menu. The drop down menu works on all other pages, but my home page where I am using Page Scroll Id, the drop down menu items are not appearing, instead there is a white box. You can see it on this link:http://www.locallinko.com and placing your cursor on the ‘About’ link in the menu. Do you have any idea how I can rectify this problem? In which other page does it work? The contact page is not using Scroll-to-id. This is not about “Page scroll to id” (which is also activated on the contact page). The sub menus on home and contact page have different CSS rules. For example, in home page the “About” li element has the classes “megamenu” and “no-caption” which completely change its submenu elements. On contact page those classes do not exist. Hi! Thank you for this plugin! I was able to get the page to scroll but after the page scrolls to the id, it scrolls again, second time faster. My first thought was that maybe it was the animation, so I tried changing that, but that didn’t fix the problem. The link that I want to scroll is the “Contact” link in the main header navigation. When clicking the Contact link it should scroll down to the footer section. Can you help me figure out what is wrong? You don’t seem to be using Page scroll to id plugin (it does not seem installed or activated). Some other script/plugin does the page animation (I saw waypoints script in your HTML). I am having a hard time trying to figure out how to get this to work properly. Can you give me step by step instructions? I know there is some within the plugin page but I still cannot figure out how to get it to link properly. This page is a step by step tutorial. If you need more info, you need to tell me which specific step you need help with. If you followed the tutorial and plugin guides and your page doesn’t seem to work, I’d need to see your code or link in order to help. I am trying to link the 5 services at the top of the page to the appropriate section below. I am using the wordpress theme 7. It doesnt exactly give you anywhere to place the div inside where the headings are. I think this is a question for the theme developers. 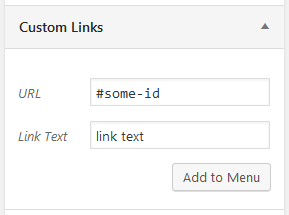 I’m not familiar with the theme but you should ask them if/how to add custom links in your content and/or how to add id attributes in your sections. 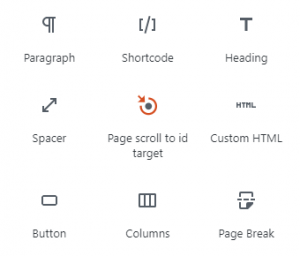 Can you add wp shortcodes in the post editor? 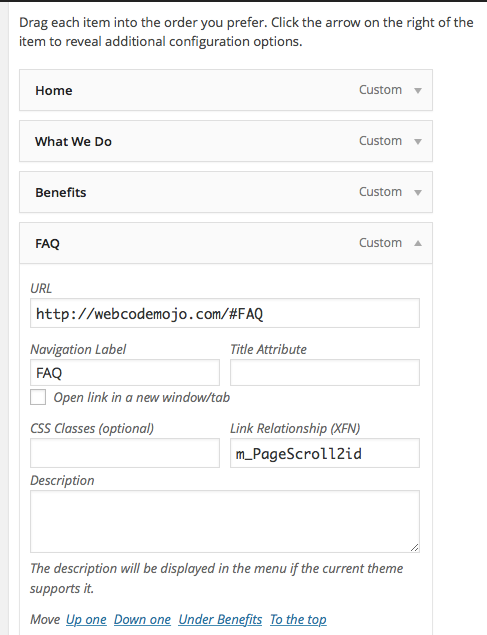 If yes, the plugin offers shortcodes for adding both links and targets (see “Help” menu in plugin settings). Thanks for the great plug-in. Can I please have assistance with two things? 1) I am not getting the offset to work. I want the scroll to not go so far as my target section is being covered up by the fixed menu. To avoid this, I entered into the Offset field, my selector, #header. I also tried inputting pixels in the Offset field, but the scroll did not appear to be impacted. A good example of this can be see if you click on the ‘FAQ’ menu item. 2) Links highlighting: This is not happening automatically. I tried to add this by modifying my style.css. Still, the links do not stay highlighted when the target section is visible. They are only highlighted on hover. Below is a snippet from my style.css. Any ideas? The links in your page do not have the rel attribute “m_PageScroll2id”, meaning your links are not handled by “Page scroll to id”. They’re handled by your theme or some other plugin which also animates the page. That’s why none of “Page scroll to id” functions work. The plugin is activated but it’s not applied on your links. See “Creating the menu links” for a guide on how to add the rel attribute “m_PageScroll2id” on the menu links. Thanks for the quick response! What’s strange is that I did set-up the rel attribute per the instructions. Below are two links to screen shots that show how I’ve set this up (including using the short code). The scrolling only worked once I set these items up, so I do think “Page scroll to id” is semi-working. Could there be something that is making it appear like the rel attributes are not set-up that is also making some of the page scroll to id functionality not work? Thanks again! The scrolling started working once you set the menu items, because your links URL pointed to sections within the same page. Before setting the URLs to include a hash (#), your theme didn’t need to scroll the page. These attributes “tell” some other script what to do (the first to scroll the page and the second where to scroll). The same script is probably removing the rel attributes (by inspecting the links via dev tools, I see no rel attributes on them). The shortcode does work but it’s not affecting the menu links. Maybe your theme has an option to disable its internal page scrolling functionality? Thanks again, Malihu, for your assistance. This is definitely a mystery. It’s like I set-up Page scroll to id, and that got the scrolling to work (i.e. without the short codes, scrolling does not work), but because something else is overriding it from being fully set-up all of the Page scroll to id functionality is not there. My site uses AngularJS. I think the issue is related to this because Googling ng-href returns a lot of items related to AngularJS. I’ll be making a donation as a thanks for the plug-in and your assistance. in “Selector(s)” field in plugin’s settings page. This might overwrite the other script(s) with “Page scroll to id” functions (at least it should enable links highlighting). This helped! I now am seeing that my changes in the Scroll to page id settings are changing the behavior of my site. I think I now just need to work through the settings to figure out exactly what they should be. Thanks for all your help!! Very many thanks for this awesome plugin. It does exactly what I need it to do – and so easy to install and set up. 1. I created a ‘home’ link, but unlike all the other nav links, the plugin jumps to the top of the page when the home link is clicked, instead of scrolling back up to the top of the page. The home link is not a section as it’s the top of the page. I have the ‘Scroll to location hash’ ticked. I am not using a URL in the title attribute box. 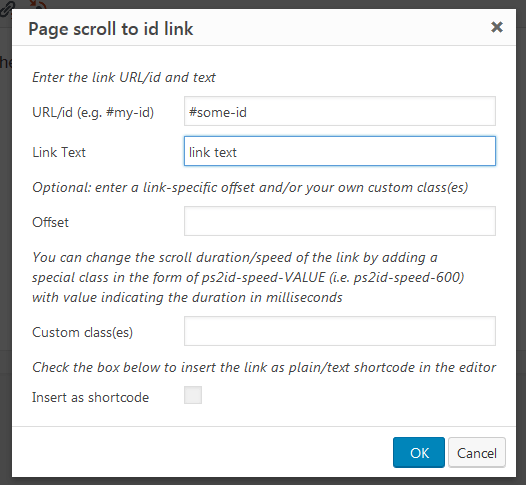 I have just added the page from the menu selection and pasted in the ‘m_PageScroll2id’ code in the link relationship box. How can I make the plugin scroll back up to the top of the page when the ‘home’ link is clicked and not jump to the top? 2. The scroll stops perfectly at every section on the page except one, it just stops a little to soon, so the bottom of the previous section is visible. I have tried to adjust the offset a little bit, but I am afraid that it may throw all the other sections off that are stopping perfectly. Is there a way to adjust one section without throwing all the other sections off? 2. Maybe you can give this section a top padding value via your CSS(?). If the offset is correct on the rest of your sections, then you should just adjust the CSS of the section that’s not. If you could send me a link I’d be able to help more on this. The home button now glides perfectly to the top of the page, thank you. Here is my website link for the second issue re: the scroll stopping short of the top of the ‘Right For Me?’ section. I haven’t adjusted the padding / CSS yet. I wanted to take you up on your offer to take a look before I started making any adjustments. I look forward to your reply and again, many thanks for your help. The issue you’re having is caused by the negative top margin on your section (CSS selector: .vc_custom_1422708818513). This is either set manually (by you?) or by the theme itself as an extra rule (it’s applied on some other sections too). It all works perfectly now Malihu. Many thanks for all you help and time. and now i dont want the smooth scrolling so i have removed the rel and deleted the plugin, but still the website scrolls to id, is there anything i need to do further to remove the scrolling comletely? It doesn’t have to do with Page scroll to id. This is a functionality of either your theme or some other plugin. No It was not ike that before I installed the plugin, do you write some JS dynamically or something where it might not removed after the uninstallation of the plugin or something? No. It doesn’t have to do with Page scroll to id. Your menu links have a js click event attached which is not handled or added by Page scroll to id plugin. In your theme’s custom.js (http://www.drbrand.ca/clients/tbgoc/wp-content/themes/Divi/js/custom.js) you have the et_pb_smooth_scroll function called on “a[href*=#]:not([href=#])” (which matches your menu links selector) and animates the page. You think it wasn’t like that before, because you hadn’t created menu links with #id in their URL before adding Page scroll to id. I am having trouble getting my side menu to work with the scrolling effect. Can you please let me know where I am going wrong. I used a selector div[id=’#’] along with the recommended one from the tutorial with out any success. Is this what you’ve inserted in “Selector(s)” field in plugin settings? If there’s an element with id “safetygames-benefits” in your page, scrolling should work. I’m not having any luck. Here are all the ways I’ve tried to link the element to the navigation bar with no luck. Hello, Malihu! I’m using your plugin, it works fine, thanks for your job! I have a question: can scrolling be on mouse wheel? Depending on your theme and page layout, you’ll need to use additional plugins (e.g. jquery-mousewheel) to be able to bind mouse-wheel events that’ll trigger “Page scroll to id” scrollTo method in a custom script in your theme. I have done everything for installing your plug-in and the links seem to work except that no scrolling animation occurs. You can see what I mean when you go to the site, select “The Bar” from the drop down menu under “Explore Our Site”. Then again at the bottom of “The Bar” text section where it says “Return to Top” and takes you back to the top page. Is the page not long enough or is the plug-in not compatible with my WP Theme? I think that your values in “Selector(s)” field in plugin settings are not correct. To start off, great plugin! Exactly what i’ve been looking for. Only issue i’m having is with the link highlighting. II’ve tried everything in the documentation, but can’t seem to get the current sections related link to highlight. Any ideas? I can’t really say unless I see your page or code. Hi! Thank you for creating this plugin! I’d love to be able to click on a navigation link and be scrolled to the corresponding article/post, but it’s not working… I already chose ‘horizontal’ in the plugin options. Do you perhaps know I could make it work? This is great, however i would like to have different pages, one on top of the other without any menu. Like a One page layout scrolling vertical. Will that be possible to accomplish with this plugin? How will you navigate through your pages/sections? This plugin deals mostly with in-page navigation, it does not create single-page themes. This plugin seems to be exactly what I need but unfortunately I’m not too savvy on the development side. I think I followed the tutorial above and I made a menu item but I just didn’t understand how to make the link scroll to the corresponding page.. If you created your links and have elements in your page with a corresponding id, it should work. 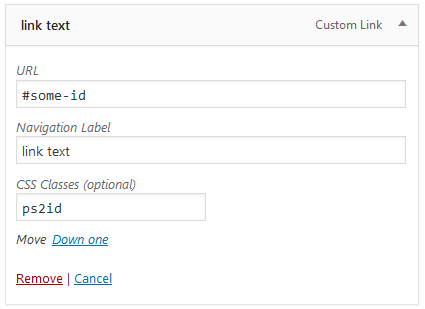 For horizontal scrolling, you’ll need to set “Page layout” option (in plugin settings) to “horizontal”. Does your page contain sections with ids like the ones in your links URL? Thanks so much for this plugin and your excellent, detailed tutorial. This is the third plugin I’ve tried for smooth anchor scrolling but the first without glitches. I’m throwing a donation your way right now. Minor error, thanks for the plug-in, still trying to figure it out, which is why I was reading the tutorial.